Just like what the OPM Christmas song says "Tuloy na Tuloy Pa Rin ang Pasko," despite of the crisis that our country is facing now, nobody can really stop the coming of one of the most wonderful season of the year, Christmas. And with the tragedy behind our back, Ayala Malls want us to celebrate Christmas Day the most meaningful way through The Joy of Sharing. This Christmas, Ayala Malls are made brighter to give emphasis on Ayala Land’s 25th year and Ayala Center’s 50th year of sharing beauty, bountiful memories love and happiness. Christmas is a time of giving and sharing with those around us. And with our favorite Ayala Malls sharing twinkling lights and Christmas carols playing on the loop, we can also witness other highlights and happenings all throughout the holiday season. Set in the backdrop of the lush imaginings of acclaimed floral designer Zenas Pineda and production designer Gino Gonzales, witness dreamlike scenery in the Ayala Malls through the display of gleam lights, the thrive of leaves and berries, the multi-hued wonders of beads and lanterns, the rustic arrangement of organic twigs, and the display of tambourines and fans adding an astonishing beauty inside the malls. Aside form those spectacles, the tunnel leading to Greenbelt will turn into a panoramic visual wonderland of Christmas joy expressed in the art of photographer, artist and chairman emeritus of Ayala Corporation Jaime Zobel de Ayala. Take a walk through “The Tunnel of Joy” and mesmerize to the magic of Christmas, seen through the fine lens of an artist. There will also be the Stars of Joy concert series that will showcase the breathtaking display of music and dance that is directed by Audie Gemora and with the musical direction of Mel Villana. Witness how the Ayala Malls has evolved through the years, and how they have captured the Filipino’s love for the arts, music, food, and the movies in this this concert. The show encourages mall goers to come together as a community and show support for the Typhoon Yolanda victims through donations. There will be donation boxes located in all Ayala Malls concierge, so if you wanna share some love to victims, do not hesitate to approach the concierge. The unveiling of Stars of Joy Concert will happen this November 19, 6:30 p.m., at the Glorietta Activity Center, with Piolo Pascual, Martin Nievera, Kuh Ledesma, Joanna Ampil, and the Steps Dancers. You can also catch the Stars of Joy concert series at the Abreeza Mall Activity Center on November 15, Marquee Mall Park on November 23, Trinoma Activity Center on November 24, Ayala Center Cebu Activity Center on November 30, Alabang Town Center’s Corte on December 7, Market Market! Activity Center on December 8, and Centrio Mall in Cagayan De Oro on December 15. From the wonderful world of the movies, Piolo Pascual, Tom Rodriguez, and Sam Milby with the Sam Concepcion will also take part on Stars of Joy concert series at the Abreeza Mall Activity Center on November 15, Marquee Mall Park on November 23, Trinoma Activity Center on November 24, Ayala Center Cebu Activity Center on November 30, Alabang Town Center’s Corte on December 7, Market Market! Activity Center on December 8, and Centrio Mall in Cagayan De Oro on December 15. 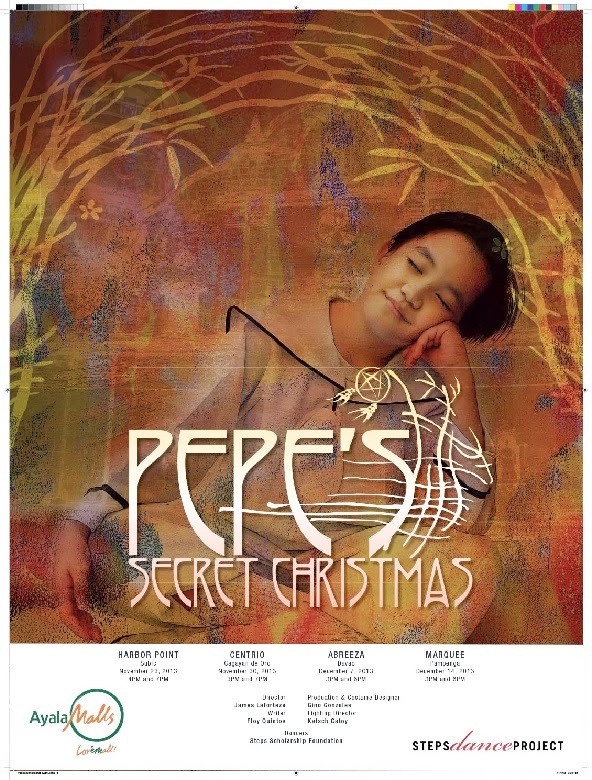 In addition to that, to spread good cheer and Christmas goodwill through the magic of dance, the Ayala Malls will also present “Pepe’s Secret Christmas”, an enchanting Christmas celebration of the Filipino seen through the eyes of a young man and a rowdy assortment of talking and dancing animals. Headed by Sofia Zobel - Elizalde, director of Steps Dance Studio and founder of Steps Dance Project, and through the direction and choreography of James Laforteza, “Pepe’s Secret Christmas” is a contemporary display of Ballet Theater that reveals the timeless lessons of traditional Filipino values, and our love for beauty and harmony. 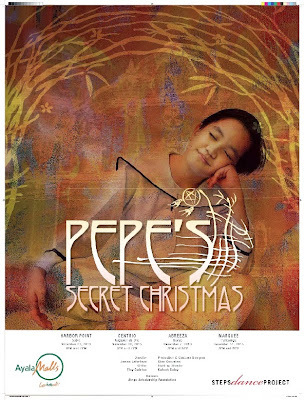 “Pepe’s Secret Christmas” will be shown at Harbor Point, Subic this November 23, Centrio Mall, Cagayan de Oro this November 30, the Abreeza Mall, Davao on December 7, and Marquee Mall, Pampanga, on December 14. 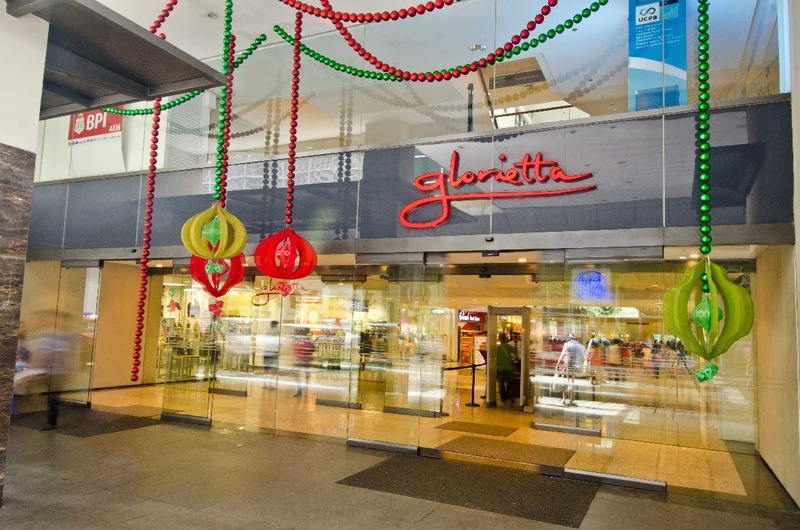 Christmas shopping is also made more magical at the Glorietta as its customers are welcomed to “A Thousand Encounters”, a photo competition and photomap exhibit inspired from a concept of Jaime Zobel de Ayala. The competition aims to capture the creative spectacles of Christmas, and celebrate the diversity and individuality of mall goers set against the background of exciting Glorietta. A photo booth at the entrance of the revitalized Glorietta will capture the myriad expressions. This is open to all Glorietta Christmas shoppers from November 14 to 17, and the contest will be awarding the Solo Creative Photo, Couple Creative Photo (for 2 participants), and the Group Creative Photo (for 3-6 participants) at their best. The winner of the Solo Creative Photo will get a shopping spree at the Ayala Malls worth P25,000, while the Couple Creative Photo winners will be treated to an overnight stay at the Raffles Suites with free breakfast for two, and the Group Creative Photo winners shall be treated to a buffet for 10 at the Holiday Inn restaurant. This year’s Yuletide celebration in Ayala Malls is also made more meaningful as the Ayala Group of Companies launches the “Tugon sa Bohol” campaign, an initiative for the restoration of the damaged churches in Bohol due to the recent earthquake. The activities include “Songs of Hope”, a benefit concert by the award-winning Loboc Children’s Choir held last November 8 at the Ayala Triangle Gardens, and “KISAME”, an exhibition of photographs of ceiling paintings of Bohol’s colonial churches on November 11 to 14 at the Fashion Walk in Greenbelt 5. With so many things we have in mind, I guess there's nothing to at least have a reason to smile for Christmas. By simply sharing some of your blessing to the victims of the recent crises in our country, Christmas is definitely turn its favor on us and will give us a memorable day. Happy Christmas, Philippines! Stay strong!